After the catastrophic launch of the federally run health insurance exchanges, the question now is how quickly the Obama administration can fix the problems and meet its target of enrolling about 7 million uninsured Americans in private health plans next year before the effort is deemed both a failure by the public and a political albatross for Democrats at the polls. Higher-than-expected volume, technical glitches, insufficient funding from Congress, HHS' late release of important regulations, and fierce political opposition to the Patient Protection and Affordable Care Act from congressional and state Republicans all have been cited as reasons for the terrible start. HHS has provided no enrollment figures yet, and a spokesperson said the department plans to release monthly updates, likely starting in the middle of November. States generally will release their figures on a monthly basis also, the spokesperson said. No one knows how long it will take HHS, which is fully or partly running the exchanges in 36 states, to ease the way for people to shop and sign up for coverage on the online federal marketplace, HealthCare.gov. Some experts say the system can be tweaked to work satisfactorily, particularly as traffic drops off from its heavy initial level. But others say it may need a total overhaul. 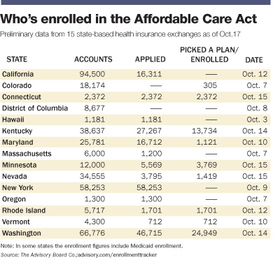 Meanwhile, some but not all of the 15 state-run exchanges have fared better, reporting that nearly 50,000 people had signed up for a plan by the middle of last week. Chip Kahn, president and CEO of the Federation of American Hospitals, said the federal exchange will lose a lot of potential enrollees if it doesn't fix the problems fast. He said the Obama administration's goal of signing up 7 million uninsured Americans in 2014 “doesn't look possible” at this point. And there are signs that things could get worse before they get better for the federal marketplace, though there have been recent signs of improvement in the federal website's functionality. 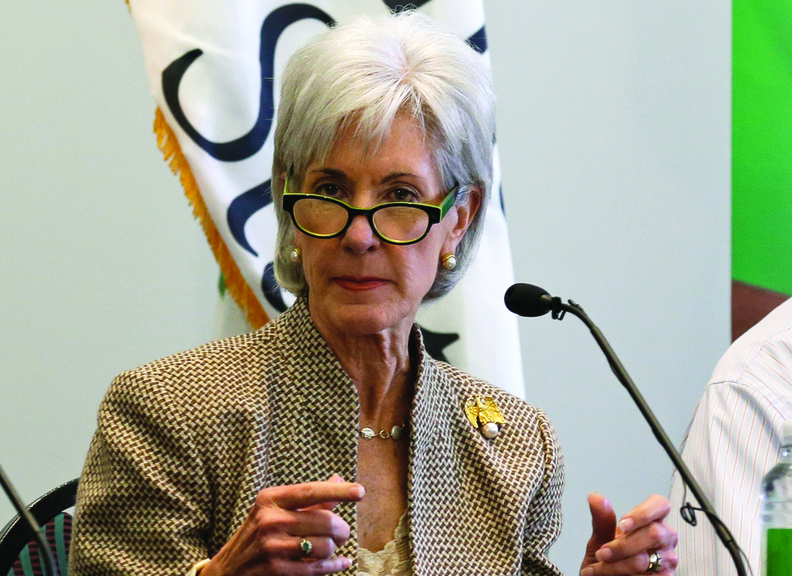 Late last week, reports surfaced that insurers were having trouble processing new enrollees because they are getting inaccurate, incomplete or duplicate data from HHS. Difficulties with the federal website could dampen enrollment, and a lower-than-expected enrollment could drive up the premiums exchange health plans set for 2015, said Christopher Condeluci, an attorney at the law firm Venable who worked with Republicans on the Senate Finance Committee when the ACA was drafted. There are high political stakes in getting the insurance exchanges to work well. The success or failure of the Affordable Care Act exchanges will hang heavy over the 2014 election cycle. Henry Aaron, a senior fellow at the Brookings Institution who specializes in healthcare financing, said the rollout of the Affordable Care Act is likely to be the biggest domestic political issue next year. On the other hand, voters could have a short-term memory about the troubled launch of the federal exchange if it's fixed soon, according to the FAH's Kahn. Miller said much will depend on what sticks in the public's mind—Republicans' role in shutting down the government, or consumers not being able to enroll successfully. HHS has added more server capacity that enables the system to carry bigger loads, installed software changes to make the system more efficient, and, for a specific component of the system that became overstressed, moved it to a “powerful dedicated hardware” from virtual machine technology, according to an HHS spokesperson. One area that insurance and e-commerce experts say the federal exchange should improve is to make it easier for consumers to shop around for plans, without having to set up an account first, said Joel Ario, former director of the Office of Health Insurance Exchanges at HHS and now managing director at Manatt Health Solutions. HHS said in a written statement that consumers should complete the application process to see more detailed plan information, including prices with federal premium tax credits if they're available. It wants consumers to see how much their out-of-pocket premium cost would be after any tax credits were factored in, so they don't experience rate shock. An HHS spokesperson said the information had been available on the site, but that HHS has since created a new tool to make it easier to use. Sam Gibbs, senior vice president at eHealth, which signed an agreement with the CMS to serve as a Web broker enrolling individuals in exchange plans, said the launch was a “major undertaking,” and that the problems of the first few weeks were predictable. The federal government and the states are not as nimble as private, e-commerce companies, he added. “We have to understand that there's time,” Gibbs said. “The enrollment window is through March 31.” The real enrollment period will be in December, when consumers need to buy coverage. Other experts agreed, saying that most consumers aren't going to buy something now when they won't receive the product until later. As HHS and its information technology contractors race to smooth out the bumps, no one knows how long it will take before the operation is running well. “The only people who know how long this will take are the people actually doing the code,” said Brett Graham, managing director and partner at consulting firm Leavitt Partners. The Obama administration will have to perform all this work rapidly while facing withering scrutiny and attacks from congressional Republicans, who promise to continue efforts to roll back the law. Last week, House Speaker John Boehner (R-Ohio) said the lower chamber will rely on “massive oversight” to highlight problems. The Brookings Institution's Aaron said the administration has to get it right, as he expects a very well-financed, vigorous political campaign by opponents next year to convince voters that the law is a failure.